With all there is to do in Moab, it’s nice to occasionally have a little breathing time. The unique and beautiful parks available in the city of Moab are the perfect place to take a quick nap in the grass. Each park has bathroom facilities and picnic tables available. Located just off Main Street, Swanny Park is a great spot to stop for a quick picnic lunch. Towering trees line the edge of the park, the acres of lush green grass, and children's playground make for an ideal place to run around and have fun! The park is also conveniently placed next to the Moab Aquatic and Recreation Center, allowing easy access to the pools and fitness facility. Rotary Park is an extremely unique park that is great for visitors of all ages. 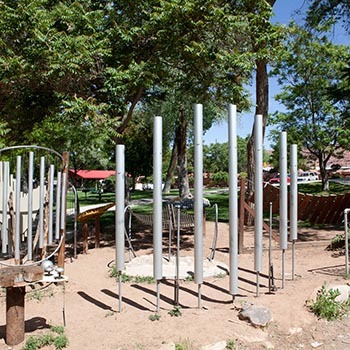 The park is home to a large discovery area of musical instruments, creating the perfect play environment for young kids; or a great opportunity for the inner-child in us all to shine through. There is also a small amphitheater and basketball court located on the east end of the park. Located on the outer part of town, Old City Park is often quiet; making it a fantastic place to sit back and enjoy the afternoon sun. With opportunities for disk golf, volleyball, horseshoe toss, and a playground - this park is perfect for families of all ages. A duck pond is also on site and makes for a fun day outside.